If you rent or own pipe and drape, you know how complicating it can become when it is time to move the pipe. It’s not really heavy, but its shape-round and long-can make for some real moving headaches. The trick is to “bundle” the pipe. This keeps all the pies together in a way that doesn’t require you to actually hold every individual pipe. Once they are bundled together, they no longer roll around in transit and can be leaned against a wall or loaded on the top of an almost full truck. 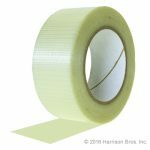 Bifilament tape is perfect for pipe bundling. It’s strong, doesn’t stretch and comes off clean. If you handle it carefully, it can even be reused. Click here and get a roll now.